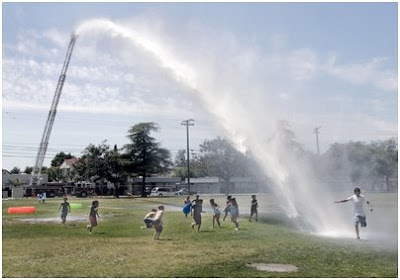 Students from the Tracy Learning Center beat the heat by frolicking under a jet of water coming from Tracy Fire’s Truck 91 to celebrate the next to last day of school Thursday. Students were treated to a "Water Day" filled with small pools, water slides and a visit from the firefighters who used the nozzle on the truck to cool off the students before heading out to summer break. The eighth-graders will have their graduation ceremony on Friday.